Every Wednesday during the regular school year, the Berkeley Hillel Kitchen Interns and student Volunteers (like YOU!) cook a delicious BBQ meal for UC Berkeley students and friends. All UC Berkeley students are welcome to attend the community-wide meal. 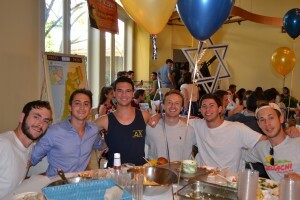 Berkeley Hillel’s BBQ is cooked 100% by students! Give back to the meal and volunteer in the kitchen or help with set-up, all skill levels are welcome. BBQ Cooking & set-up: Wednesdays, 3 – 5:30 p.m.
BBQ meal: Wednesdays, 6 p.m.
For more info, email Savyon at ssordean@berkeleyhillel.org.